What I am about to say may come as a shock to the one or two dutiful readers who do not happen to know me personally. I do not own a T.V. Yes, in my ever obsessive quest to live life more modestly, or try to anyway, I left our four-year old oversized television on the doorstep for Salvation Army about two moves ago with the hope that in its absence we would turn off the noise during dinner, read books endlessly into the night, and become learned and wiser with each passing day. Then came baby. And while we love talking, chasing and reading to baby, sometimes baby needs a time-out and so do we. One restless morning about eleven months ago when baby was just starting solids, I happened across a discovery that completely changed our world, Youtube clips of Big Bird and Snuffy singing “Elmo’s Song.” This soon gave way to using our Netflix account to instantly entertain baby with all his favorites during those uh-temperamental times. Now a blossoming toddler we have evolved into group downtime, as one can only take so much Elmo. So what does a Prude choose to keep the whole family entertained during that half-hour between supper and bath time when no one wants to re-watch the final season of Lost with me? In came The Cosby Show – all eight seasons of it. We are working our way through season three having relived the series from the beginning. After watching the first two seasons I began to pine away for the eighties (which is rare). Not for the clothes and definitely not for the hair, but for those half-hours that my family would gather around our television set and check in with the Huxtables. Being a child in the eighties I reasonably understood that there was something special about seeing this particular family on T.V. And I eventually realized that whenever my parent’s became really excited and my dad reached for a VHS tape and began recording an episode (and he recorded many), that there was someone special on the show. Looking back over these same episodes one after another, I understand that indeed something special was taking place. While I’ve heard and seen reviews of critics who say The Cosby Show depicted a small segment of African American Life that was somehow unrealistic in its portrayal because not all black Americans lived like the Huxtables, and others have even described the Huxtables as a white family in black face. I say give me a break. First of all I will contend that the problem with this attitude is that it places social and ideological limitations on what can and cannot be perceived as “realistically” black when in fact black experiences in the U.S. have always been rich and varied. 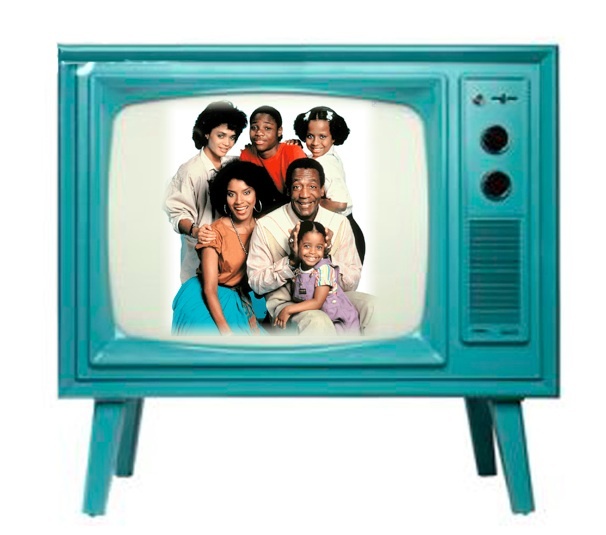 Secondly, I argue that the real problems people may have had with The Cosby Show, are not with this show at all, but more so with America’s need to have one black person, author, family, political figure or organization stand in for all of black America at a particular time (hmm…sound familiar). The problem this creates is the false expectation that one person, or institution will dutifully “represent the race”. While I am not arguing to absolve people of their social responsibility, I am challenging that no other racial-ethnic group in this country is expected to have singular ambassadors in art, music, politics, education etc. So why not have Cosby and The Wire, Tyra and Tavis Smiley, after all the last time I checked my blackness was not stagnant or monolithic. 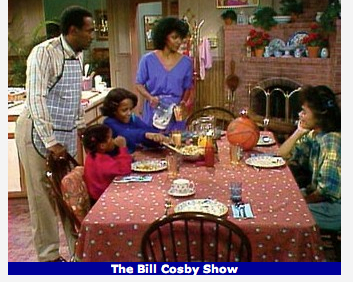 Finally, I believe The Cosby Show did a lot more good for black America than bad. Where else in television then and now can you tune it to hear the names of historically black colleges such as Howard, Hampton, Tuskegee, and Maherry, dropped as if they were Harvard or Oxford? Where else then or now can you go to see an assortment of theatre, art, musical and sports legends such as Dizzy Gillespie, Lena Horne, Judith Jamison, Tito Puente, Art Blakey, Stevie Wonder and Olympic medalist Joshua Culbreath. These are just a few from the first two seasons and do not even include the many actors and musicians some who have passed on like the late Miriam Makeba, and others who are still around today such as Alicia Keys, Blair Underwood, Iman, Lela Rochon etc. 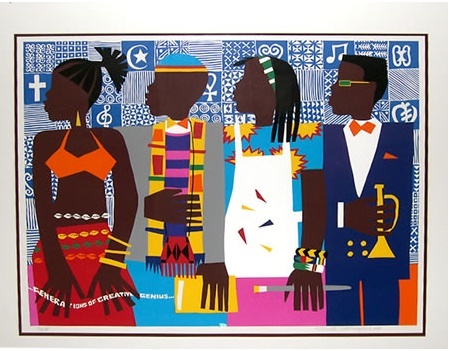 Work by the late Varnette Honeywood entitled "Generations of Creative Genius"
In all, I feel The Cosby Show showcased the very best that black American culture has from ruminations on the March on Washington, and performances by the Count Basie Orchestra, to the background images of paintings by artist Ellis Wilson, and Varnette Honeywood, and Ernie Barnes. Not to mention the wearing of Kente cloth bow ties and hats during black tie events. It illuminated the historical trajectory of black experiences while at the same time making that history relevant to the contemporary moment. And it did it in a way that made all of us in my house proud to watch. No, my parent’s are not Doctors or Lawyers, and although we lived in New York we were about six hours from Brooklyn. My father was raised in a Watts Housing project and my mother came from a working class background of folks who emigrated from the south to California after WWII. All of these social and economic differences did not make us feel any less connected to the conversations on The Cosby Show like grades, music, grand parents, and monsters under the bed. In fact as I re-watch the show today, I see uncanny similarities between my parent’s and the Huxtables. Perhaps the only thing The Cosby Show did get wrong for my house, was the idea that between sixteen and eighteen it would be perfectly reasonable and acceptable for a young woman to date. My father wasn’t having any of that, no matter how many times he saw Cliff meet one of Sondra, Denise, or Vanessa’s boyfriends. You are currently reading A Cosby Show Redux at The Prude Papers.